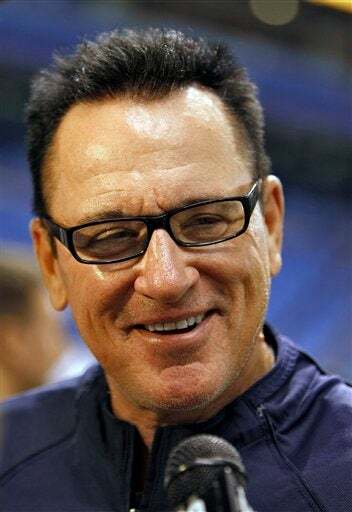 •Joe Maddon goes the Just For Men route, dyeing his hair jet black to turn around the Rays' fortunes. It worked for Wicked Lester, didn't it? •Nationals GM says it's "unlikely" Stephen Strasburg will pitch for the team this year. You should probably read that as: it's "likely" the Nationals would like to avoid having his four-year deal kick in until 2010. •Another day, another Brandon-Marshall-pissed-off-at-the-Broncos story. This time it's because a team flack told players not to express too much joy at Marshall's acquittal on domestic violence charges last week. No word on how much joy they would have been allowed to express had he been found guilty. •Old folks who should probably be retired keep coming back. This time it's John Smoltz, who's close to a deal with the Cardinals. Not a bad move: they're a little short on starting pitching, and he'll automatically become the third best hitter in that lineup. •Pedro Martinez and Jamie Moyer combine for nine innings, four hits, one run, eight strikeouts, and thirty thousand, eight hundred and eighty nine days on earth. And one win. •The NCAA is investigating the eligibility of Tennessee freshman RB Bryce Brown, and some alleged recruiting violations involving cash for college visits. But here's the shocking part: Lane Kiffin had nothing to do with it! •Look, just because Kevin Gregg has blown a fifth of his save opportunities, and just because he's got a double-digit ERA this month, and just because you can hear the collective sphincter of Cubs fans tightening every time he comes in, is no reason to take him out of the closer's role. Actually, those are all pretty good reasons.